Appoint a 'school cycling champion' who will coordinate activities and be the main point of contact during the awards process. Provide cycle parking and changing facilities. Create a school travel plan and identify safe cycling routes to school. 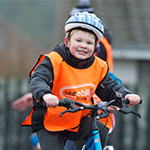 Deliver Bikeability Scotland cycle training. Promote extra-curricular cycling to pupils and the wider school community. Participate in promotional cycling activities, such as The Big Pedal, and other initiatives that promote cycling, such as the Eco-Schools award. When applying for the award, the school will first complete a self-assessment against these criteria, and you will then be visited by someone from Cycling Scotland who will carry out a short assessment and provide advice. If you'd like to apply for the award or find out more, please visit Cycle Friendly Primary School page or Cycle Friendly Secondary School page.